This past Friday there were a few openings around LA I wanted to catch. The plan was to make a trek across the city beginning with Thinkspace Gallery in Silverlake and ending at C.A.V.E in Venice. I’m not going to pretend to be an art critic so this will not be a fair and balanced review of what I saw, but i WOULD like to share some of the work that blew me away. First up, Thinkspace is consistently one of my favorite galleries to visit because they are SO ON POINT all the time. The work they exhibit is fresh and dynamic and always a pleasure to see. 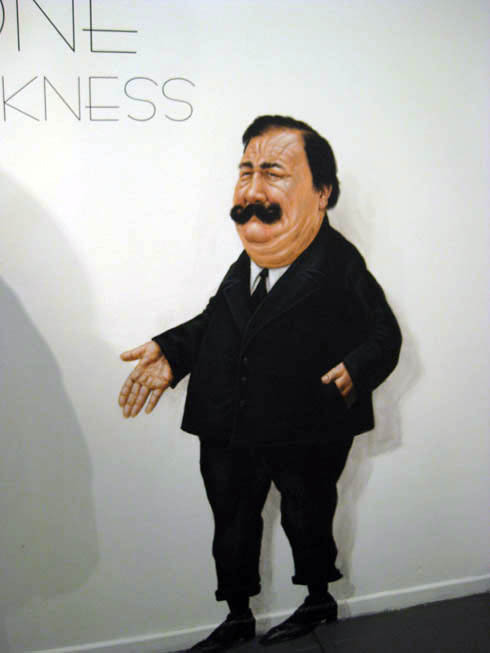 This month’s exhibit was Timothy Karpinski and Turf One. Karpinski’s work was pastel, soft, romantic and felt so very nostalgic in some way. 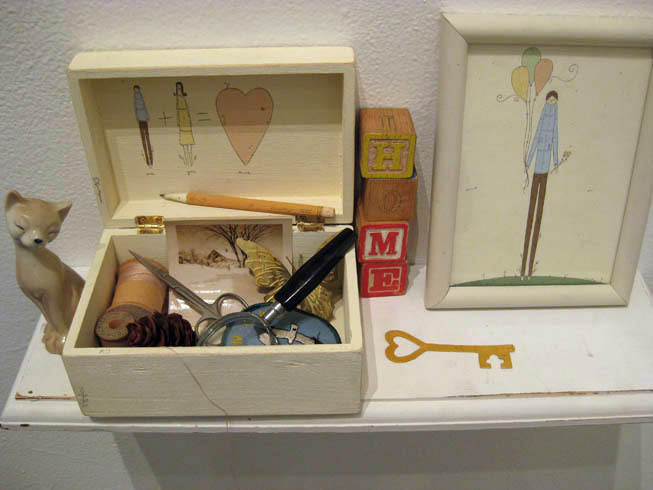 There were an abundance of painted paper cutouts woven together to create figures and stylized wooden cutouts with tiny messages written in secret spots. Turf One’s work was in the back of the gallery with two pieces painted directly on the wall. 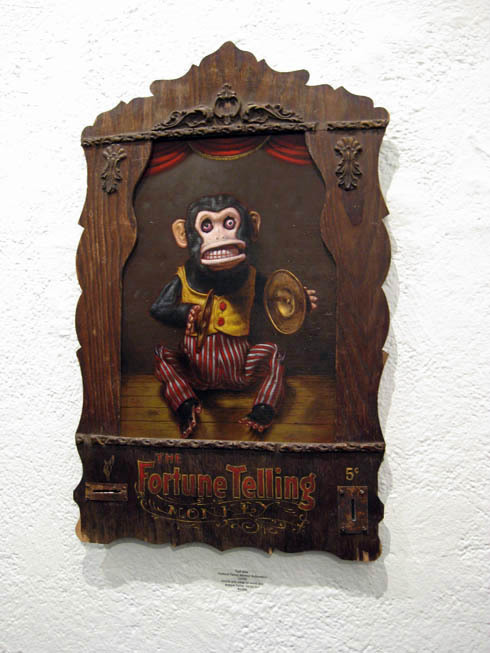 The paintings were whimsical and bizarre and a little dark and so very beautifully rendered. There was also a wonderful mix of tactile objects and unusual frame which made the paintings beautifully self-contained little islands of wonder. And really, do you see this monkey? I think he’s going to pop out and cymbal me in the face. Next I hit up Copro Nason for the Wilderness Buffet show. Unfortunately I arrived 10 minutes too late only to be asked if I’m “picking someone up” by a tall man in a suit. Confusion set in momentarily, later to be dispelled by the sound of top 40 tunes bumping from a nearby space and the vision of overdressed adolescents. Apparently I had crashed the end of a high school homecoming dance at Bergamot Station. Moving on. C.A.V.E Gallery in Venice was my final stop. 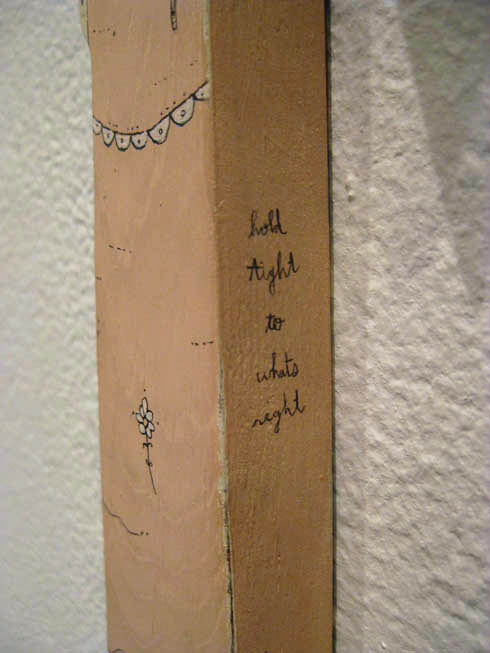 There was a group show on that night, but two pieces struck me in particular. 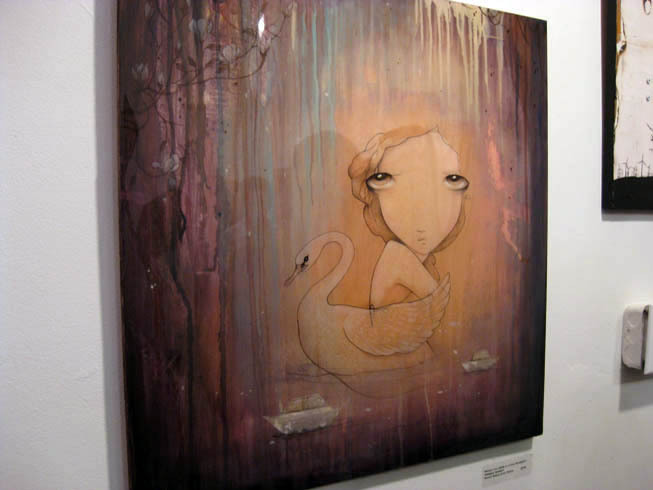 The first was a piece by Kendra Binney, whose work I’d seen before in pictures, but never in person. I have to say I was absolutely stunned by this piece when I walked in. It’s painted on a wood panel, and covered in a heavy coat of resin which gives it a really striking appearance. It’s reflective and vibrant and so dimensional. Absolutely beautiful. 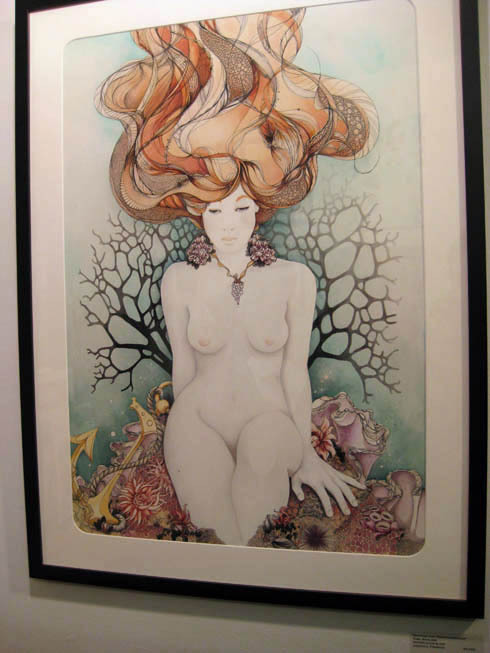 The final showcase is a watercolor by Tina Darling which was beautifully illustrated and had a perfect mixture of this large subtle form in the middle surrounded by this really intricate hair. I absolutely love seeing artworks in person. I always come away being surprised and inspired and just feeling elated overall.